What number of Grammy Awards has U2 won? When you're a band that makes music as good as U2, the rewards and accolades soon start to come your way. So much so, that the moment you hit big, you also hit big with Grammy Awards. The most coveted of all music prizes, the Grammy Awards are the true measure of success. If they give one to Michael Jackson, you should want one too. And funnily enough, U2 have won more Grammy's than Wacko Jacko who took 13. How many? In total, it's 22. Here's a list of all the Grammy Awards U2 have won, most recent to first. 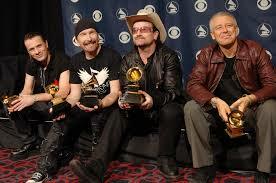 U2 have also won a Golden Globe Award for their song, 'The Hands that built America' which was used on the soundtrack to Martin Martin Scorsese's Gangs of New York film. U2 have been nominated for two Oscars for Best Original song being The Hands That Built America and also for 'Ordinary Love'. The latter song was inspired by Nelson Mandela and was included on the Mandela: Long Walk To Freedom. movie. Neither song won the gong!